I had an experience buying online this weekend from retailer Hanna Andersson that prompted me to write about customer service – and about when, and how a company decides that losing customers is okay. My story is simple: this past Wednesday evening, as I was thinking about the meal I was going to cook for Thanksgiving the next day, I did some online shopping. Inspired by one of the gazillion catalogues I’d gotten in the mail, I popped over to Hanna Andersson’s site and started looking around. If you’re not familiar with Hanna Andersson, they’re a Swedish-based company (with locations in the U.S.) that sells children’s clothing. The clothing is great quality, well made, durable – and not the least bit inexpensive. Some twenty minutes and $190 later, I’d purchased several dresses and a new supply of winter tights for my kids. It doesn’t take much buyer persona work to confirm that I’m Hanna Andersson’s target customer. I know what I want and like, I have the means to buy it and I’m not much of a bargain hunter. Which does not mean, of course, that I don’t like a bargain, it’s just that I’m driven more by quality than I am by price and I get tired of buying crummy clothes from Target that fall apart after a few wearings. The next morning, I got an email from Hanna (since we’re pals now, I’ll just call her by her first name), telling me about a free shipping special. I remembered that I had just paid $16.95 for shipping literally a few hours before. I resolved to send their customer service team a note asking them to apply that to my account, but I didn’t do it on Thanksgiving. I had other priorities. 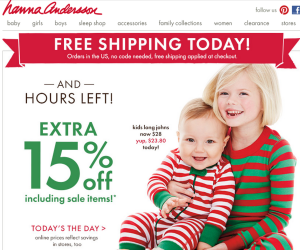 The following day, Hanna emailed again to tell me about a 15% site wide discount. I momentarily wondered what kind of an idiot I was, shopping the day before Thanksgiving, but didn’t worry too much about it — confident they would make it right. As an aside, my team and I have spent lots of time working with ecommerce clients and some of our focus has been training customer service teams. Our collective goal is always happy customers. That doesn’t mean we’ll encourage customer service reps to meet unreasonable demands, but it does mean that if what a customer is asking isn’t unreasonable, and if it not only makes sense to extend whatever they’re asking for but also keeps them happy and coming back for more, we’re happy to accommodate. Today I emailed Hanna, outlining the details surrounding my purchase and included a copy of my invoice. I didn’t ask for both a discount and a rebate of the shipping costs (I’m not unreasonable) – I just asked for the $16.95 in shipping charges to be credited to my card. In response, I got an email that could best be described as a nonsensical non-answer to my original inquiry. I responded, taking care to clarify that I wasn’t asking for two discounts, I was simply asking for the free shipping offer to be credited to my account – a whopping $16.95. And by this time, I was irritated enough that I indicated that if that wasn’t possible, that I would just return the whole order. I’m fairly easy to please in most cases, but when it becomes a matter of principle, there’s no amount of cute clothes that is worth giving in. That shipping & handling cost had just become my line in the sand. The response I received was a speedy one. I was advised that they were sorry, but they couldn’t extend that offer to me, and that if the package arrived and I wanted to return it, that I could do so easily (and for free) by just writing “Return to Sender” on the package. So there it was. Hanna was done with me. For $16.95, they were willing to walk away from not only a $190 order, but from a regular customer and from a long-term relationship. And I don’t get it. I don’t understand when customer service reps aren’t empowered to make decisions and use their judgment. I don’t understand when the total value of a customer relationship isn’t taken into consideration when making what should be fairly simple decisions. I don’t understand how it can be worthwhile to a company to operate in this manner – no matter how profitable they are. And I don’t understand why it’s a good idea to walk away from a customer willing to buy expensive products over something so insignificant as minimal shipping and handling costs. Which they were happy to give away twelve hours after I placed my original order. So what about you? Do you think I’m being unreasonable and that I should just shut up, pay the $16.95 and be done with it? Or are you, like me, annoyed by little things like this that you expect will be easily taken care of but which become sticking points that sour a whole shopping experience for you? I’d love to hear what you think. Update: I wrote this post last night and actually woke up this morning feeling bad about publishing it. I really don’t like holding brands up as examples and was concerned I sounded like an entitled consumer whining about first world problems. In fact, I intended to review the piece and edit it, again, to make sure I didn’t sound like a hag. Then, I saw this offer in my morning email. And decided I was even more pissed off. It’s great to hold firm when you offer free shipping a few hours before a purchase, and again a few hours after a purchase, but if I don’t hit your “window,” I’m toast. 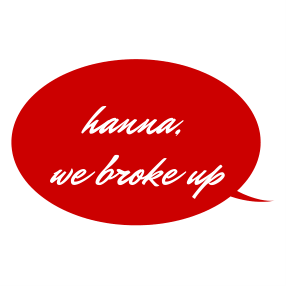 Hanna, we are never, ever getting back together.